On Saturday 18 April, close to 400 events will take place worldwide in order to highlight the growing international movement against TTIP and similar so-called trade agreements. In Sweden, the national network Stoppa TTIP Sverige is also growing and several events have been planned for the occasion: in Stockholm, Malmö, Örebro and Gothenburg. Small Ones Develop has been involved in the preparation of an event that will take place on Mynttorget, Gamla Stan. Close to 700 people have already said they would show up on Facebook and it should be a day to remember. Here under is the event’s poster where you can see that 4 speakers will be there as well as 3 bands. There will also be a huge monopoly-man-like character, an information area and a petition table. 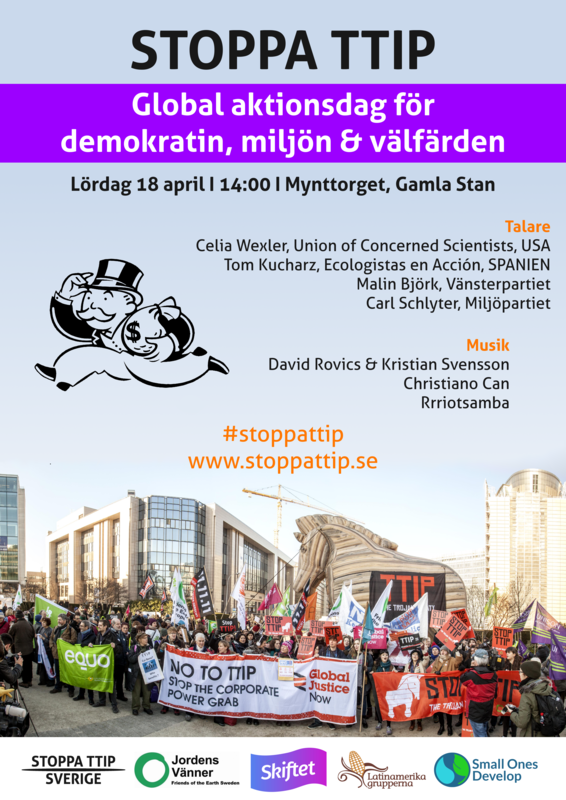 So on Saturday, if you too are concerned with TTIP, come, sign, listen and enjoy some good music from 2PM. The event is organised by members of Jordens Vänner, Skiftet, Latinamerikagrupperna and Small Ones Develop.